The salary of a nursing assistant is dependent on a number of factors such as years of experience, specialization within the field, location, etc. A survey carried out by indeed.com reveals that the average CNA salary, in December 2014, was $24,000 which was 2% lower as compared to the job postings nationally. The information given by the Bureau of Labor Statistics proved that 41,340 nursing assistants were employed in the state (as of May 2013). The average annual salary in the same year in MO was $22,820, and the mean hourly wage was $10.97. Employment per 1000 jobs was 15.67. 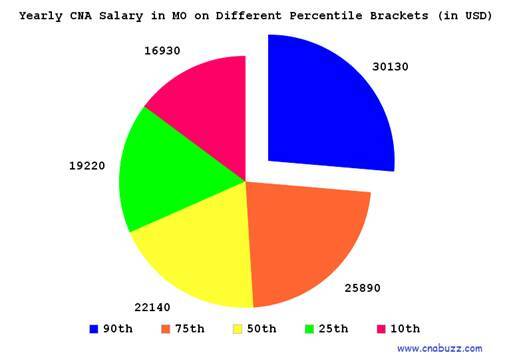 CNA salary in Missouri is primarily decided by the work location of a CNA. Nursing assistants working in urban areas are paid higher than those in rural areas. 90% of CNAs were paid less than $30,130; 10% received more than $30,130. 75% of certified nurse assistants earned less than $25,890; the remaining 25% earned more than $25,890. 50% of the employees were offered less than $22,140; the rest 50% were offered more than $22,140. 25% of CNAs were paid annual wages less than $19,220; 75% were paid more than $19,220. 10% of employees were salaried less than $16,930; 90% received more than $16,930. By analyzing the below given table, we can conclude that Blue Springs, Independence, Kansas City and Lees Summit are the highest paying cities in the state with the median monthly salary of $2,518 and median annual salary of $30,213. The lowest paying city was Joplin with an annual salary of $24,000. The median weekly salary ranged from $462 to $581 while the median hourly salary ranged from $12 to $15. Job title is another important factor that decides the salary of a nursing assistant. In Missouri, the highest earning job title was CNA Hospice with an average salary of $31,000. 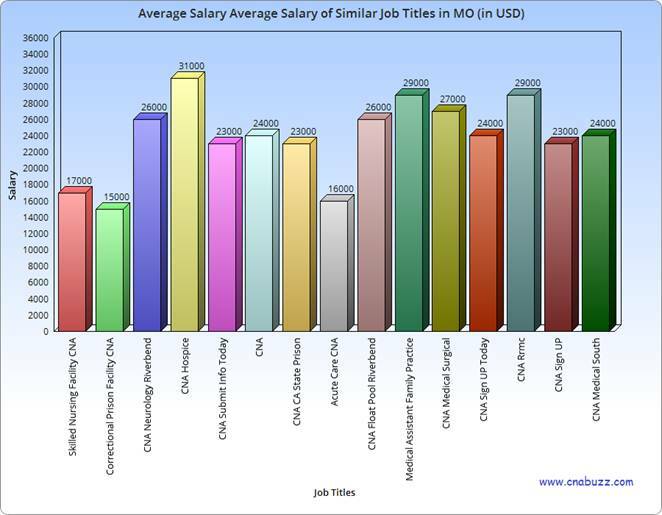 On contrary, Correctional Prison Facility CNA was the lowest earned job title with an average salary of $15,000. Other job titles salary ranged from $16,000 to $29,000. Nurse aides receive several perks other than salary, so that they remain motivated towards work and live a satisfactory life. The job opportunities for nursing assistants are expected to rise by 21 percent in near future (as per the data given by the U.S. Bureau of Labor Statistics). With the increasing population, the demand for CNAs will also increase. Additionally, the growing rates of several dementias and chronic conditions enhance the demand of these workers. Question 1 – I’m planning to move to the state of Missouri, what is the average CNA salary in the state? Answer – As per the data provided by the indeed.com, the expected average salary of nursing assistants is $24,000 per annum. Question 2 – I’ll be completing my certification next month; I wanted to know the highest paying job titles. Answer – The highest paying job title in the state of Missouri is CNA Hospice, they receive $31,000 as of December 2014. Other job titles which receive handsome salary include CNA Rrmc, Medical Assistant Family Practice, and CNA Medical Surgical.